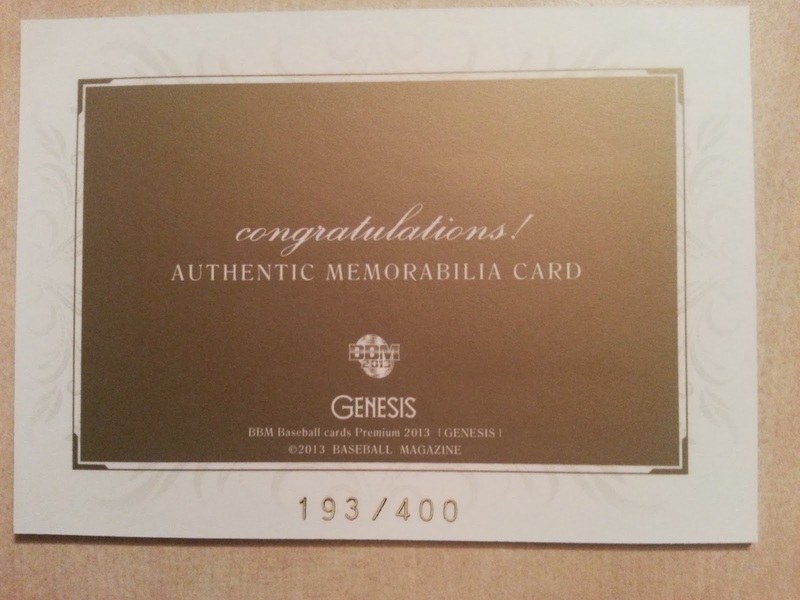 In case you missed it, yesterday Henderson Alvarez threw a no-hitter for the Marlins against the Tigers. What was significant about this was that the Marlins were held scoreless through the first eight innings themselves so when Alvarez left the mound after the top of the ninth with his no-hitter intact, he didn't know if he was going to have to keep pitching more innings. 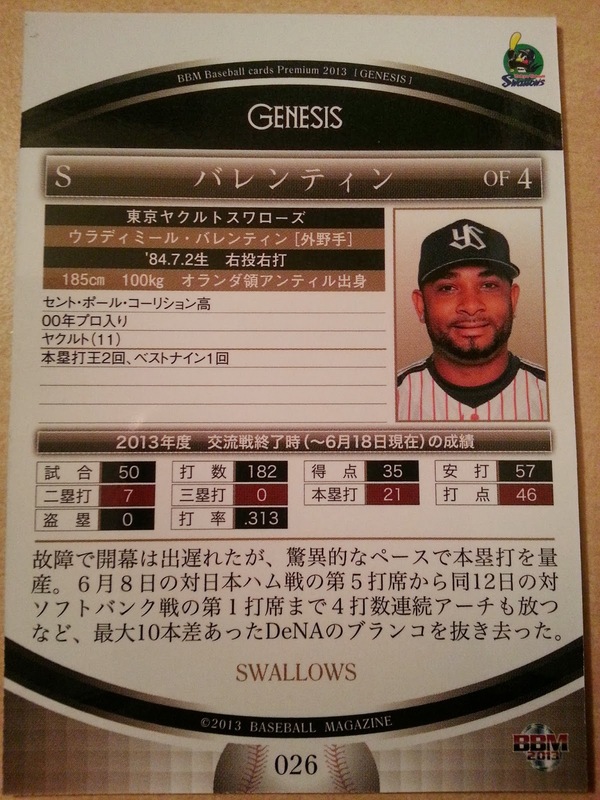 Luckily for him, the Marlins scored a run (on a wild pitch!) in the bottom of the ninth so he had a run-of-the-mill nine inning no-hitter albeit a walk-off one. Something similar happened 40 years ago in Japan but it was even more crazy. 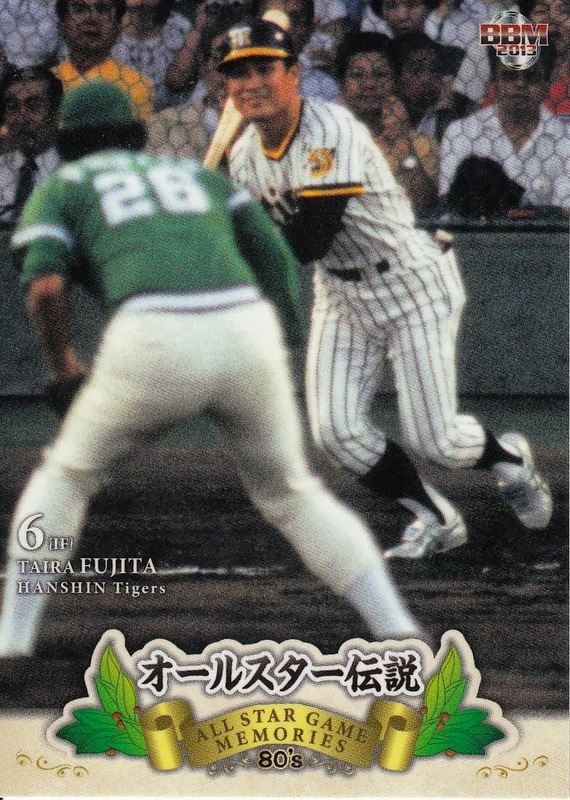 Yutaka Enatsu of the Hanshin Tigers took on the Chunichi Dragons at Koshien Stadium on August 30, 1973. He took a no-hitter through nine innings, but the Tigers were unable to score a run against the Dragons starter Yukitsura Matsumoto (I think) so the game went into extra innings. After pitching two more no-hit innings, Enatsu was able to end the game by hitting a Sayonara home run in the bottom of the eleventh for a 1-0 Tigers win. 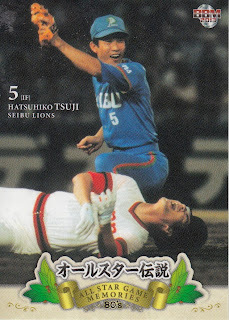 Talk about taking matters into your own hands. 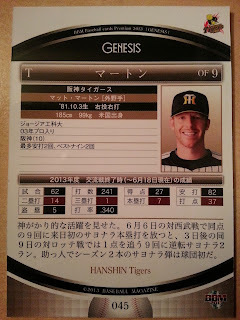 The Tohoku Rakuten Golden Eagles clinched their first ever Pacific League pennant last week. 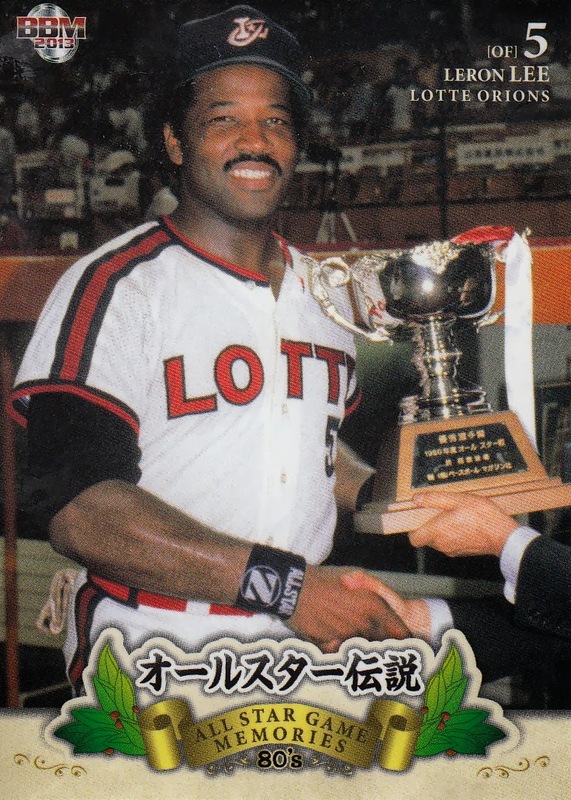 This is the Eagles ninth season. They were created in 2005 to replace the Osaka Kintetsu Buffaloes who were "merged" (really assimilated) with the Orix Blue Wave, creating the Orix Buffaloes. 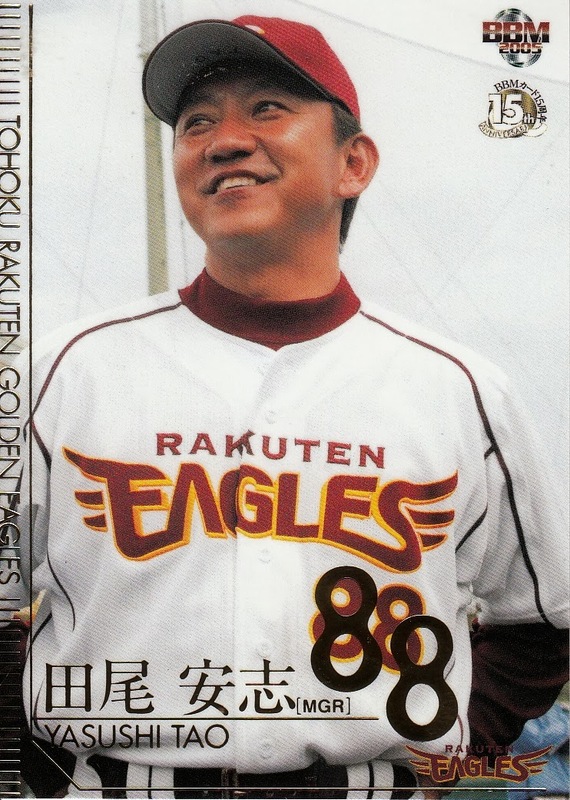 The Eagles first manager was Yasushi Tao, former star outfielder for the Chunichi Dragons, Seibu Lions and Hanshin Tigers (and Ichiro Suzuki's favorite player when he was growing up). 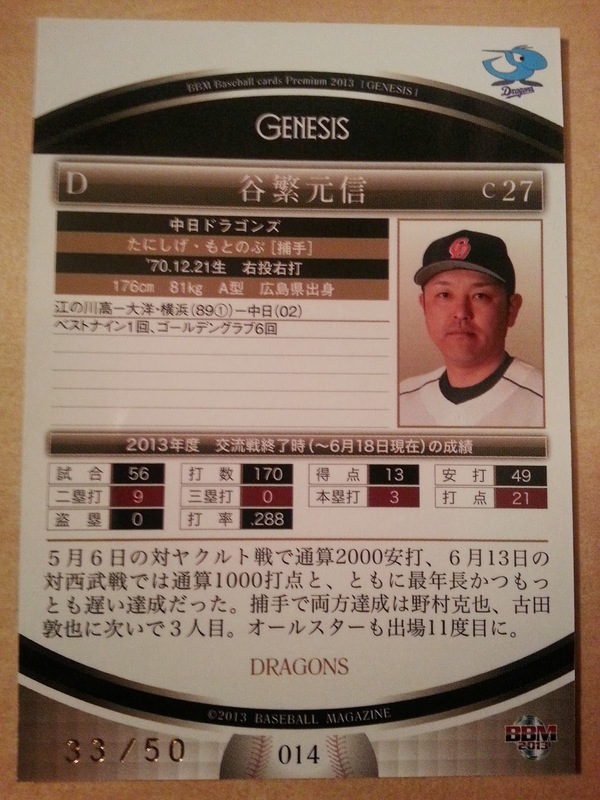 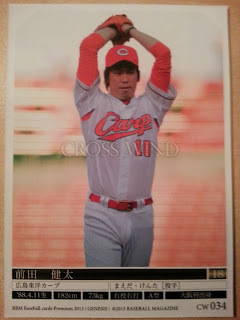 Tao was a teammate of current Eagles manager Senichi Hoshino when he was with the Dragons. 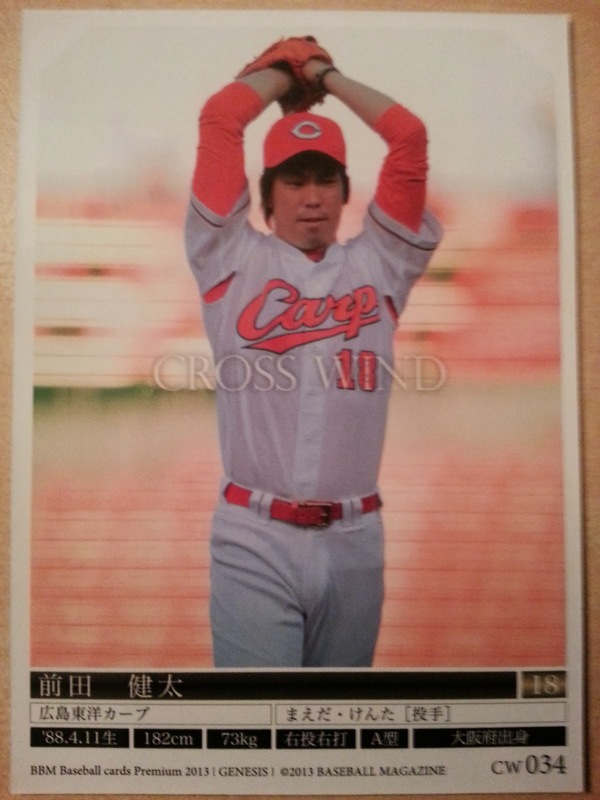 The team finished their inaugural season with a record of 38-97 and Tao was let go. 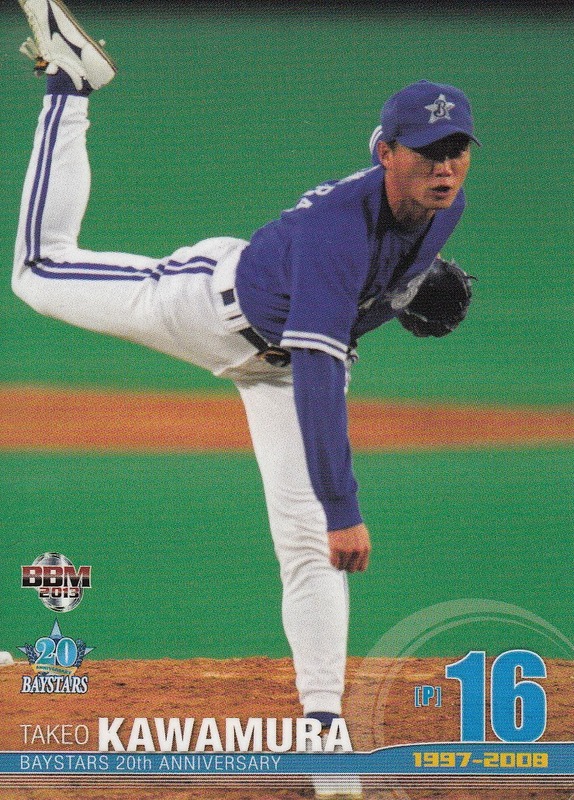 This was the only year that Tao ever managed a team (at least so far). So I've probably pretty much established that I'm not a big fan of the high end cards, including BBM's high end sets (Diamond Heroes, Touch The Game and the current one, Genesis). 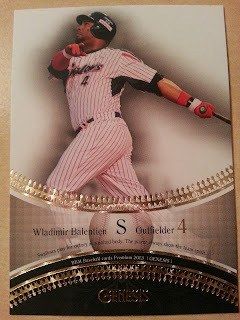 And if you've been reading me for a while, you know that I usually buy complete sets, not unopened material. 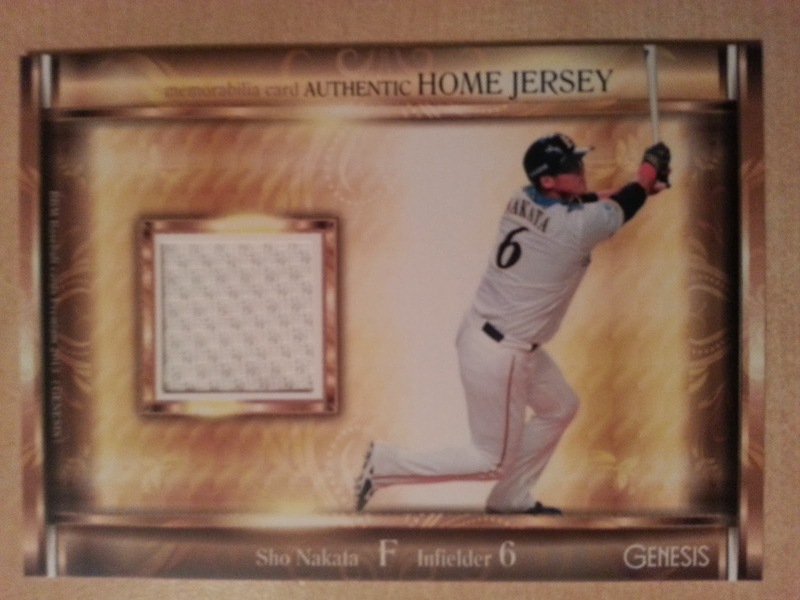 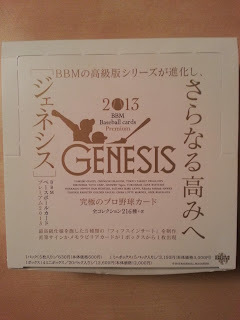 So you might be surprised that I'm doing a post about opening a box of this year's Genesis. 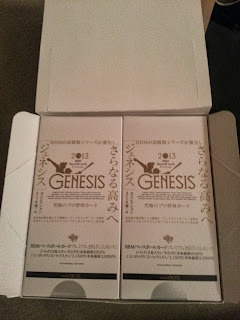 Well, there's a simple explanation - it's not my box and it's not my box break. I got an email the other day from a reader named Pete who, during the course of the conversation, revealed that he had recently picked up a box of Genesis. 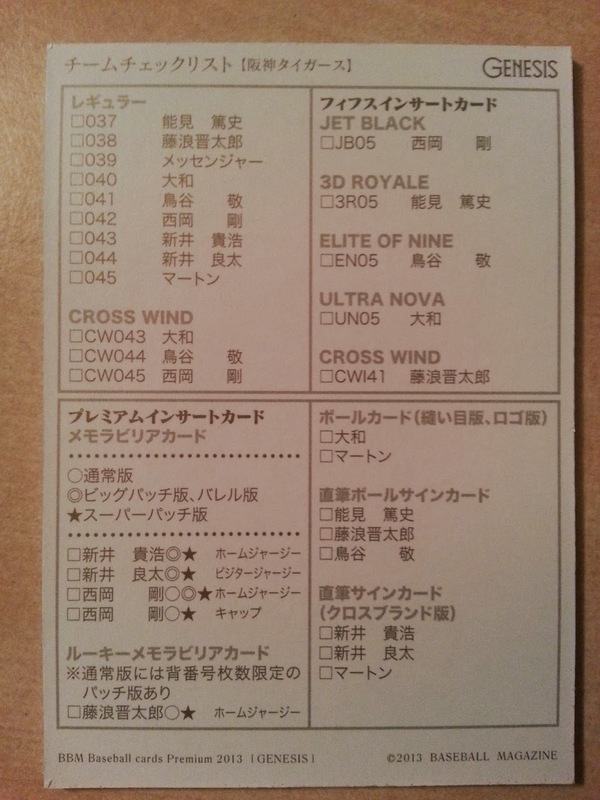 I asked him if he'd be willing to give me the breakdown on the box for a post and not only did he agree, he was kind enough to take a bunch of pictures and send them. 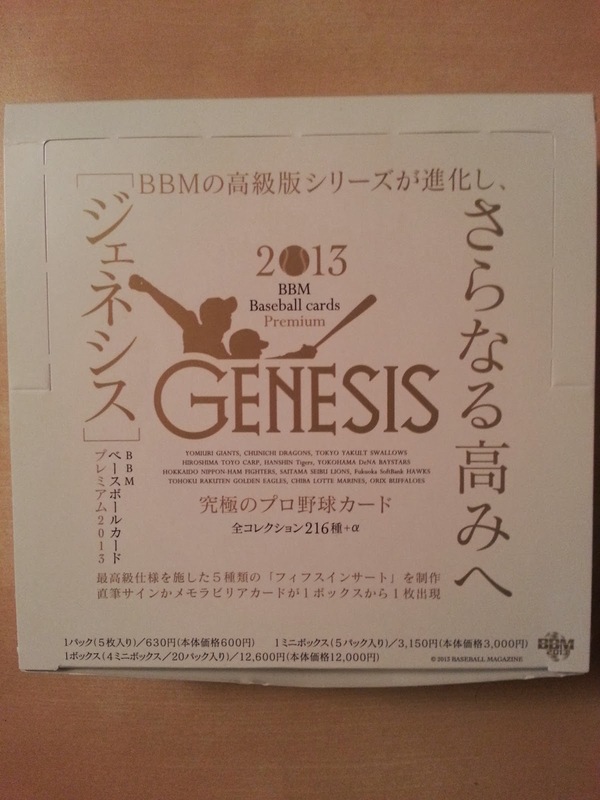 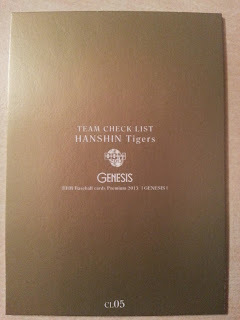 The Genesis set has a base set of 120 cards - 108 player cards (9 per team) plus 12 team checklists. 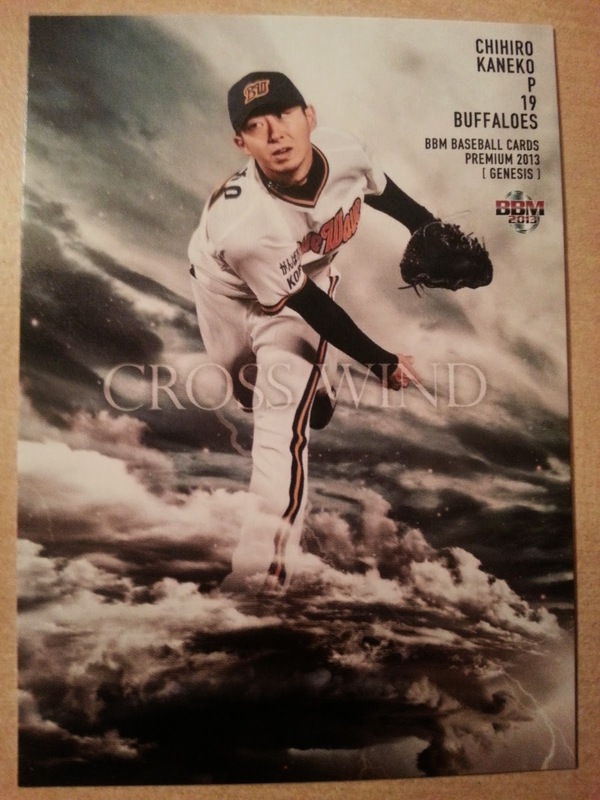 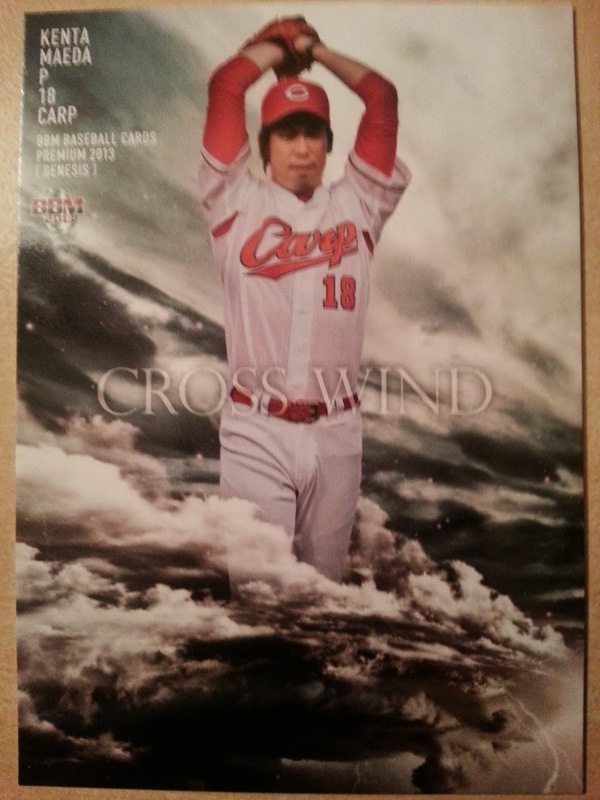 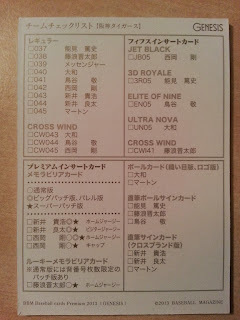 In addition there's 36 cards for the final edition of the "Cross Wind" cross set subset (3 per team). There's also a bunch of insert sets and various memorabilia cards available. 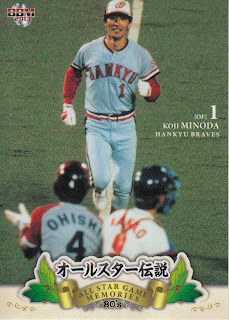 And parallels. 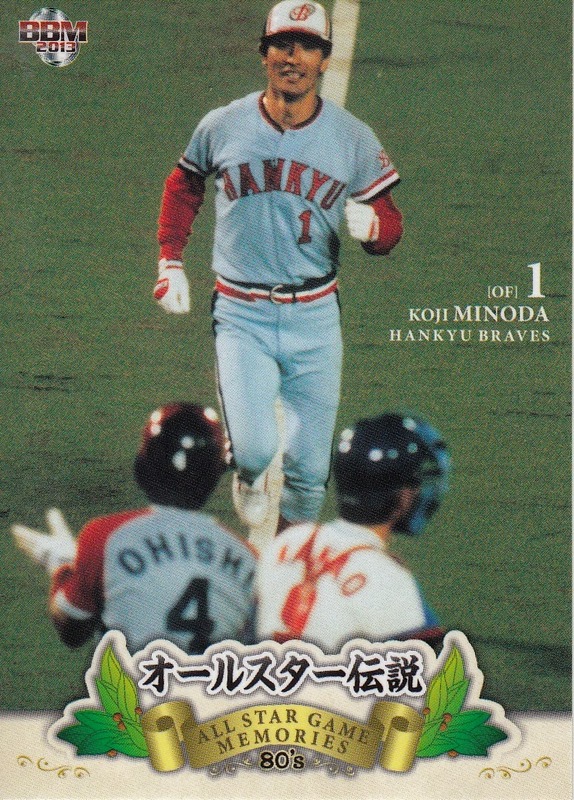 Lots of parallels. You can see all the regular cards here and a bunch of the inserts, parallels and memorabilia cards here. 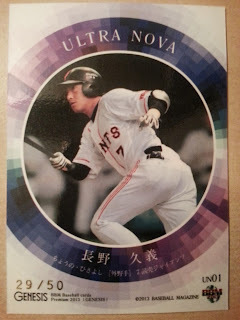 Pete told me that he had ordered the box from Niki via Rakuten Global Market. 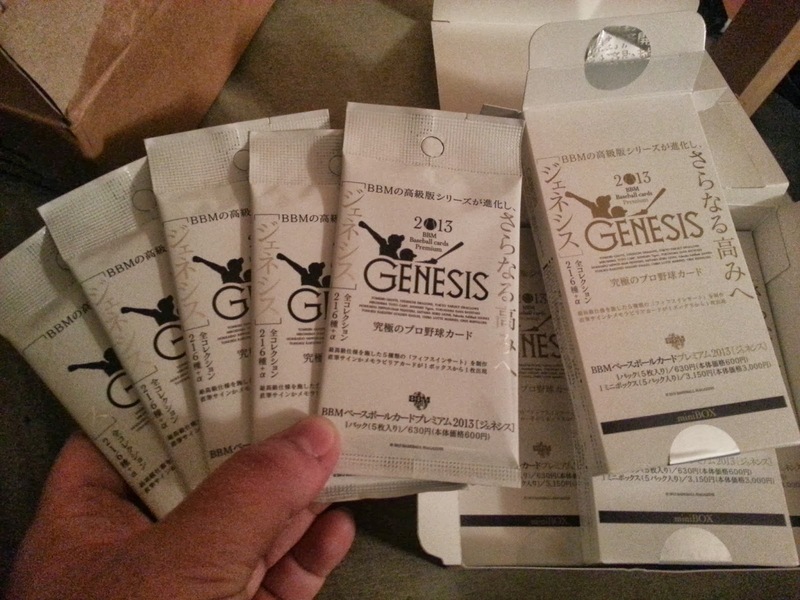 He says that the box actually contains four smaller boxes in it. 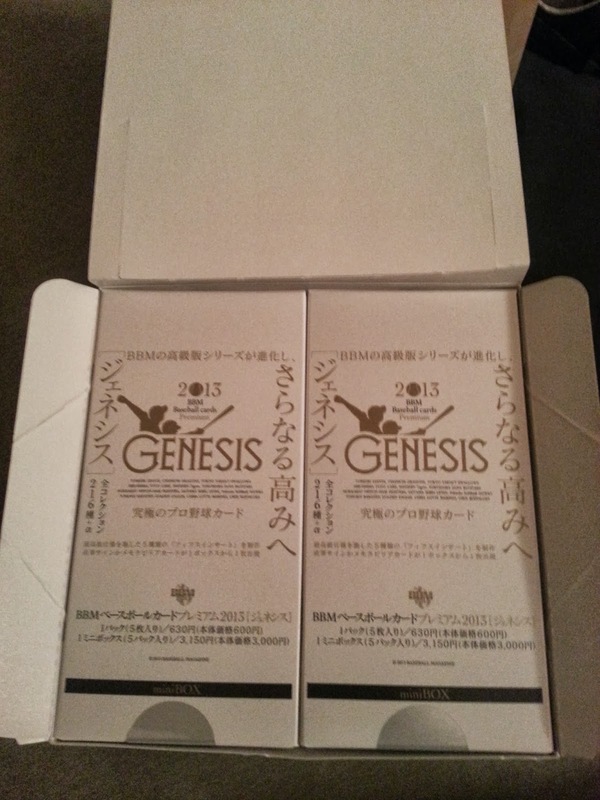 Each of the smaller boxes contains five packs containing five cards each. So there's 100 cards total in the box. Nice to see that BBM has been able to come up with a theme for the team checklists that's more useless than the mascot ones. 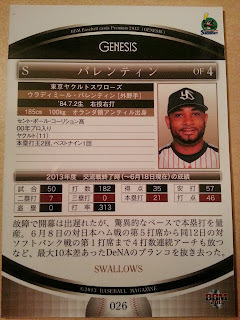 So thanks Pete for sharing the photos and stats on the box. 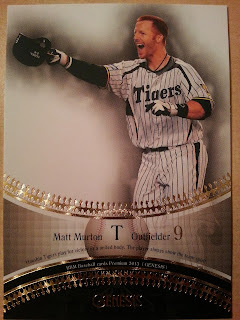 If anyone else opens a box and wants to share photos and stats, let me know. 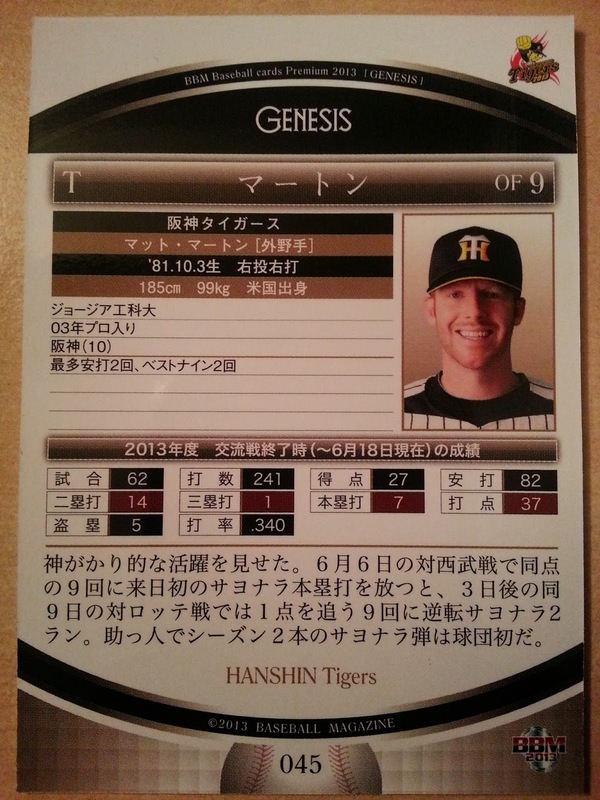 I think this is a cool way to get a little bit of information out that's different than what I normally post about. 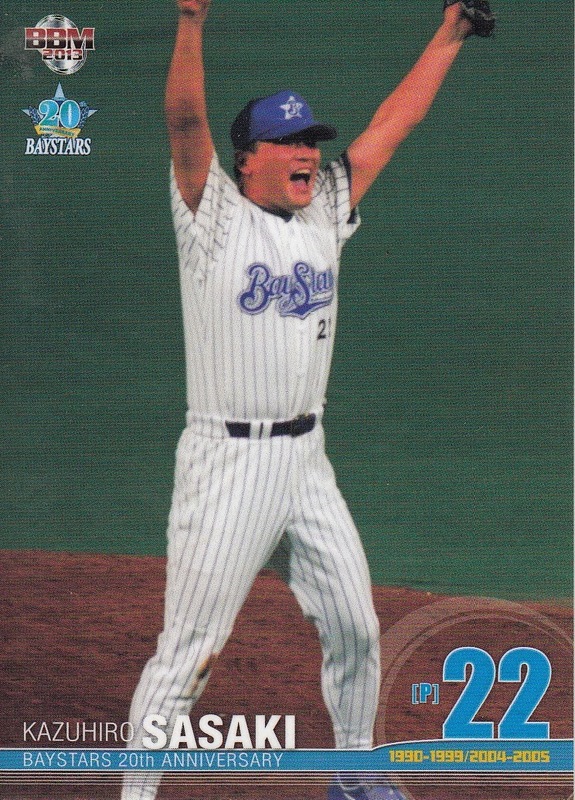 No set from BBM for this year's All Stars but they did put out a historic set back in July highlighting the guys in the All Star games during the 1980's. 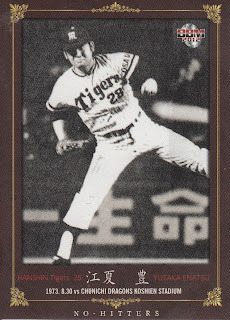 The set is called "All Star Memories 80's" and contains 90 cards - 81 cards of individual players, three cards for what I guess were classic pitcher/batter match-ups and six combination cards. 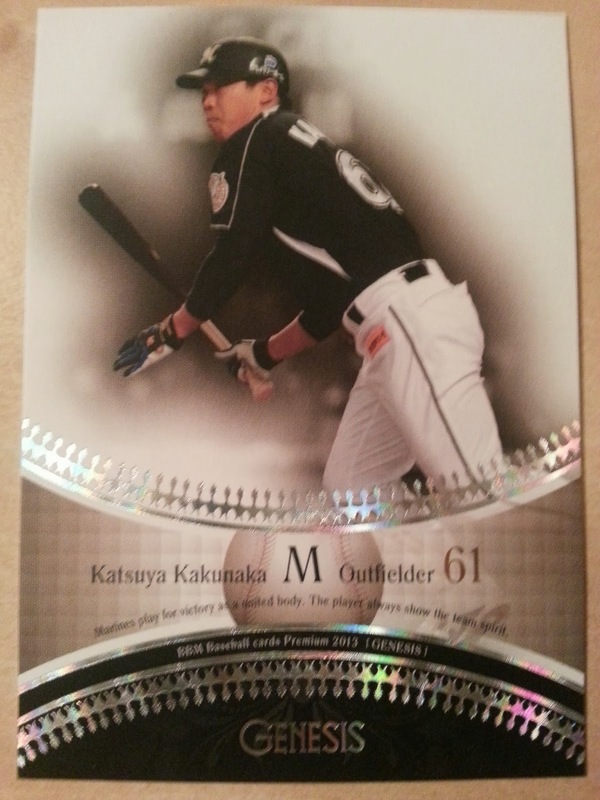 It looks to me that the pictures on the player cards were all taken during actual All Star games. 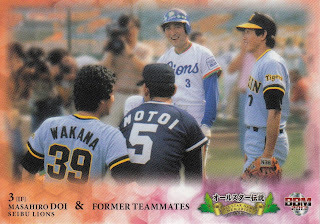 A number of them were obviously taken during the games as you can see several players in different uniforms in the shot. 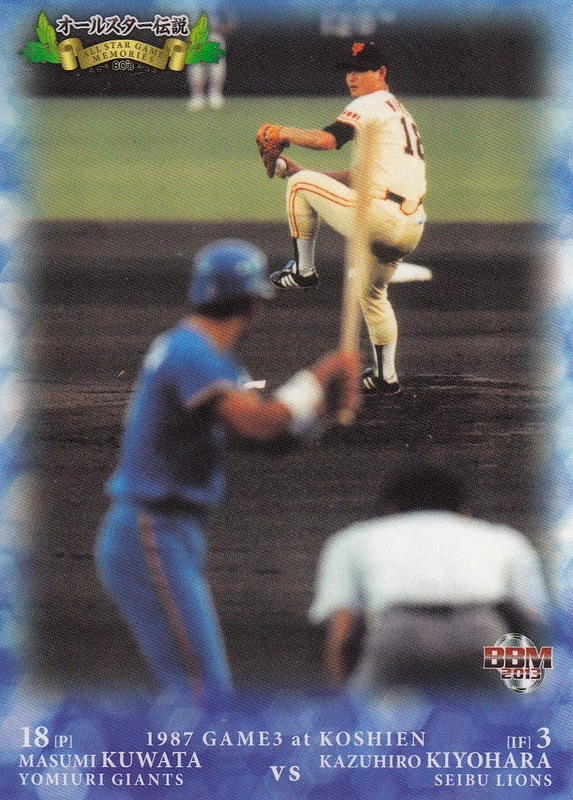 There are some shots that could possibly have been taken during other games but I don't see any pictures that obviously were not taken at an All Star game (no shot of a batter with a catcher from the same league squatting behind him for instance). 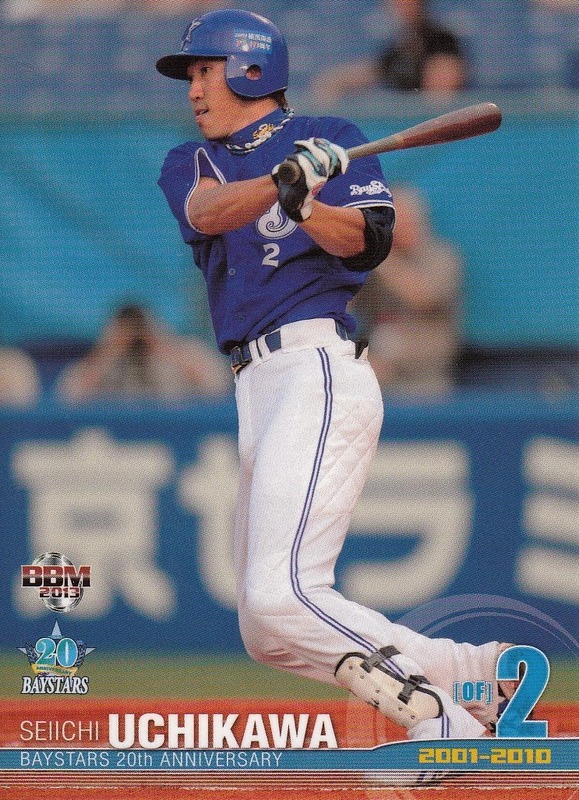 Given that this was one of my complaints about the last couple All Star game sets where BBM made a big deal about the shots coming from the games but you not really being able to tell, I think this is great. 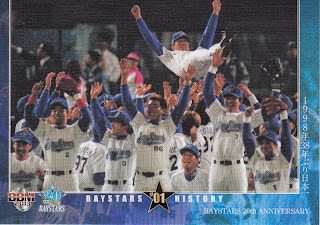 Although there may be a little too many shots of guys celebrating winning a game MVP award by sitting on the hood of a car and holding up a big key. 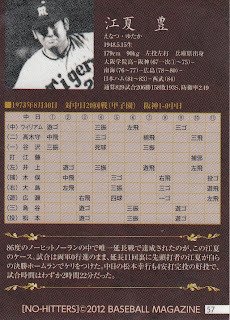 The players appearing in the set include a wide selection of Hall Of Famers and lesser stars - Sadaharu Oh, Katsuya Nomura, Sachio Kinugasa, Koji Yamamoto, Koji Akiyama, Kazuhiro Kiyohara, Masumi Kuwata, Hiromitsu Kadota, Randy Bass, Kimiyasu Kudoh, Keishi Suzuki, Tsutomu Wakamatsu, Tsutomu Itoh, Yutaka Fukumoto and Hisashi Yamada among many others. 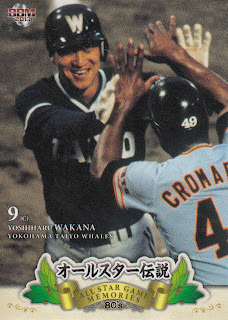 The only big stars of the 1980's that I can think of off hand who aren't in the set are Warren Cromartie (who can be seen on Yoshiharu Wakana's card) and Hiromitsu Ochiai (who hasn't appeared in an OB set since the Dragons let him go after the 2011 season). There are two subsets in the set. 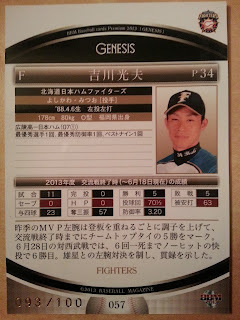 The first is a three card subset featuring what I assume are some sort of significant pitcher/batter match-up. 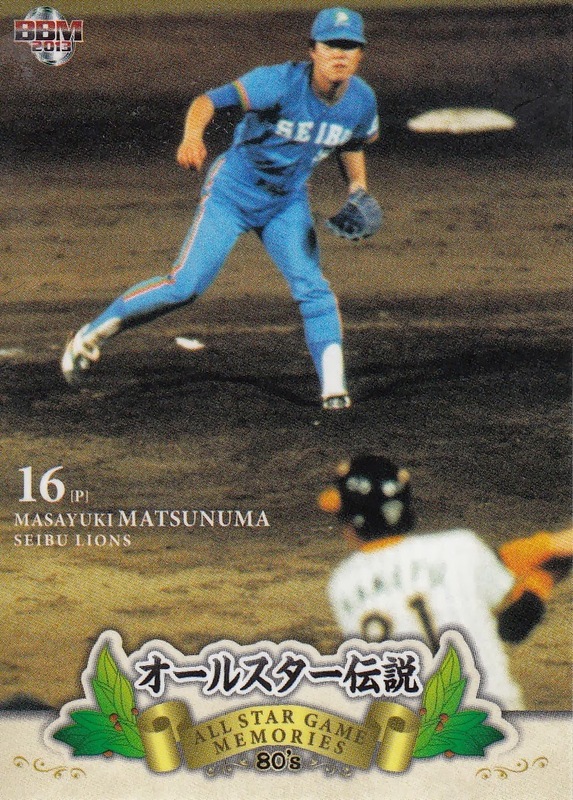 They show Kazuhiko Ushijima of the Dragons pitching to Nobuyuki Kagawa of the Hawks, Suguru Egawa of the Giants pitching to Daijiro Ohishi of the Buffaloes and Masumi Kuwata of the Giants pitching to Kazuhiro Kiyohara of the Lions. I know that Kuwata and Kiyohara were high school teammates so maybe that's the reason the other two pairs are commemorated also. 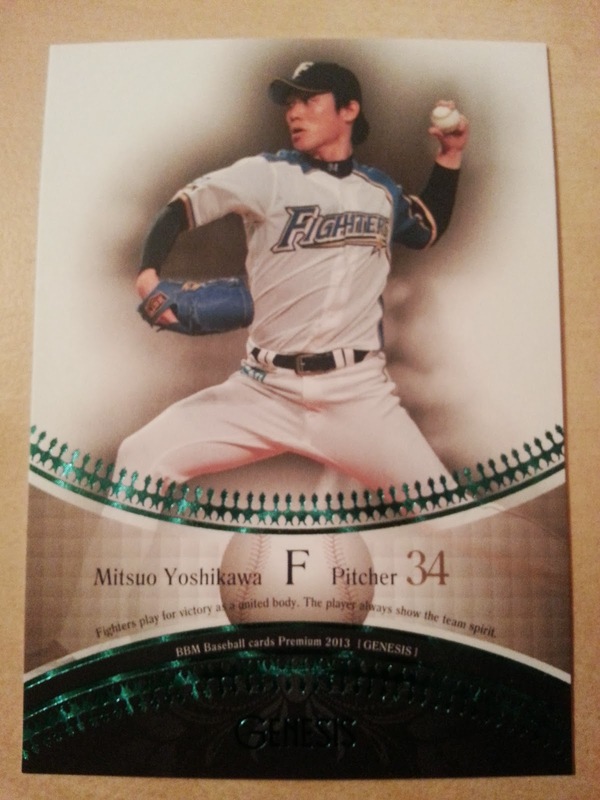 As you might have guess, I really like this set. I'm hoping that BBM does editions for other decades as well. 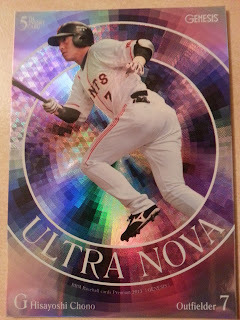 You can see all the cards at Jambalaya and Ryan did a post on the set last month also. 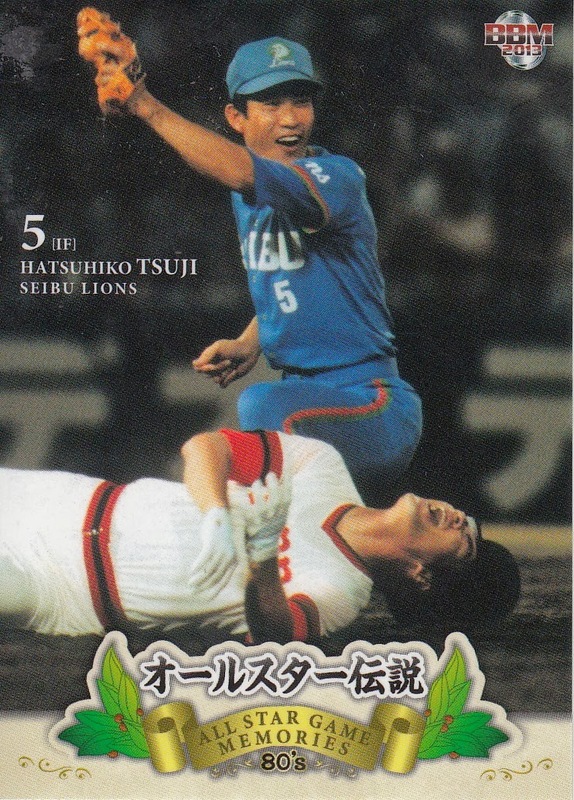 On August 20, 2006, Waseda Jitsugyo took on Komadai Tomakomai in the finals of the annual Japanese High School Baseball Championship - a tournament better known simply as "Koshien". Yuki Saitoh started for Waseda Jitsugyo against Masahiro Tanaka for Komadai Tomakomai. Both pitchers ended up going the distance in a game that ended 1-1 after 15 innings, the first time the title game had ended in a tie since 1969. 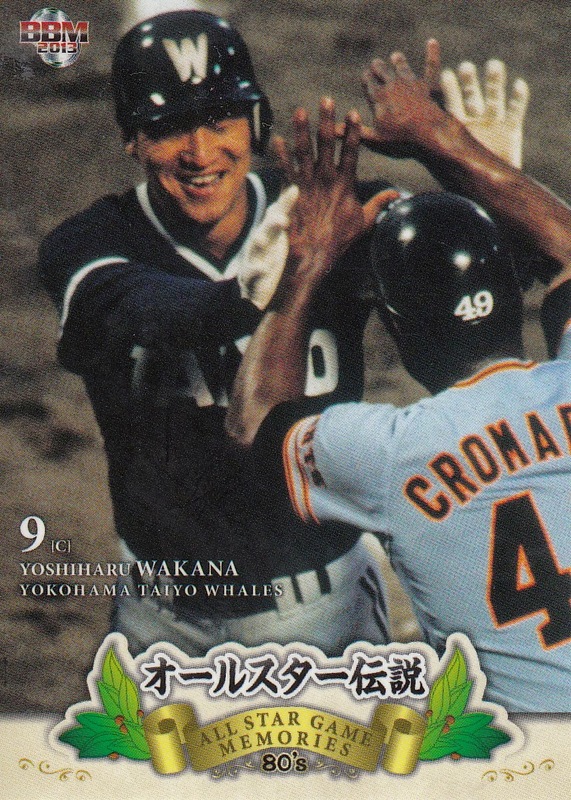 A rematch was scheduled for the next day and Saitoh again started the game, pitching another complete game in Waseda's victory 4-3, striking out Tanaka to end the game (I don't think Tanaka started for Komadai - I think he came in in relief late in the game). 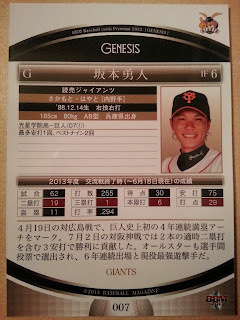 The two games made a national star out of Saitoh (and Tanaka to a lesser extent). 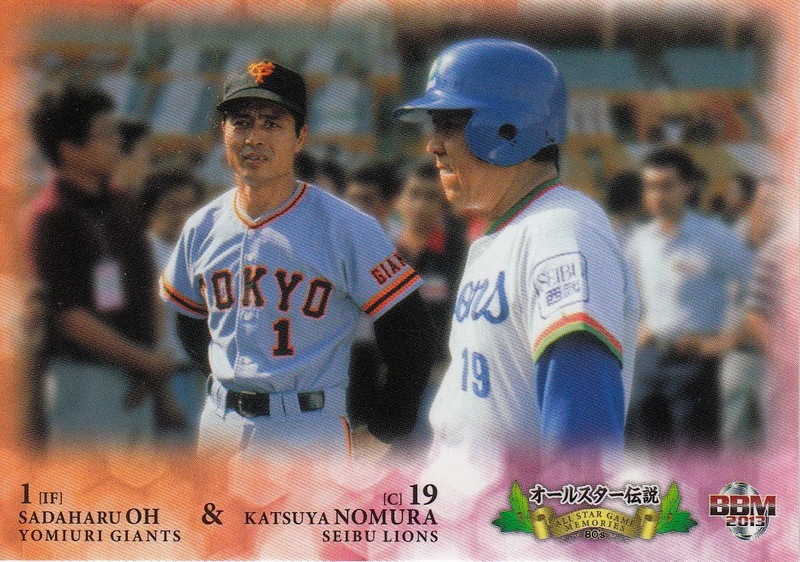 It was the final high school game for both pitchers and the divergence of their careers since then has been interesting. Tanaka decided to go pro and was selected by four teams in the first round of the 2007 NPB Draft (which was held in October of 2006) with the Eagles winning the rights to sign him. 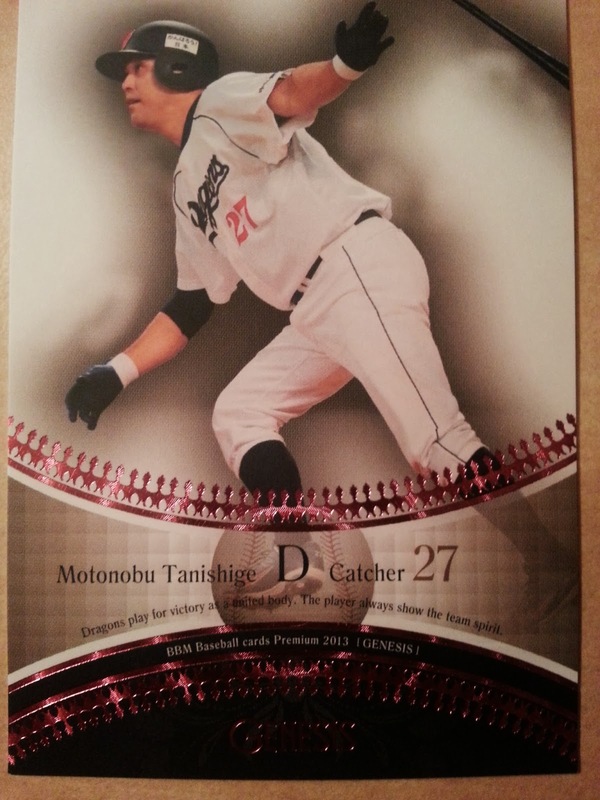 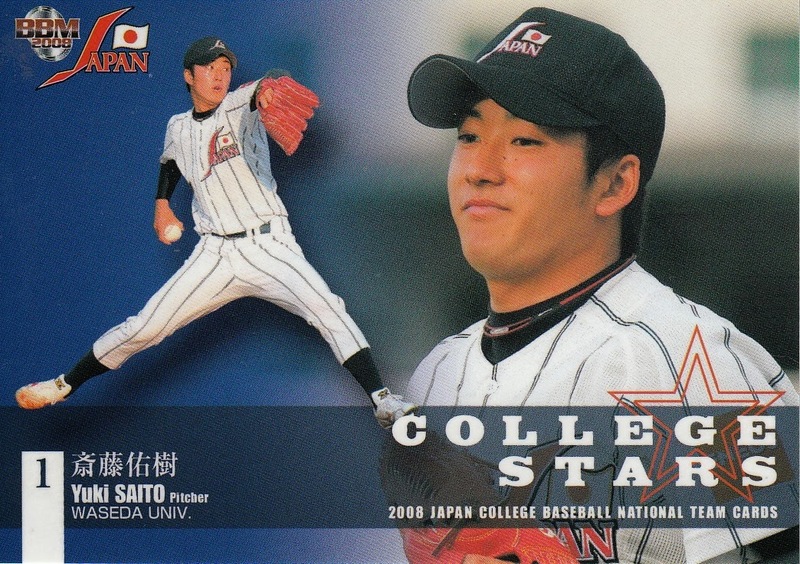 He's gone on to win the 2007 Pacific League Rookie Of The Year and the 2011 Sawamura Award. 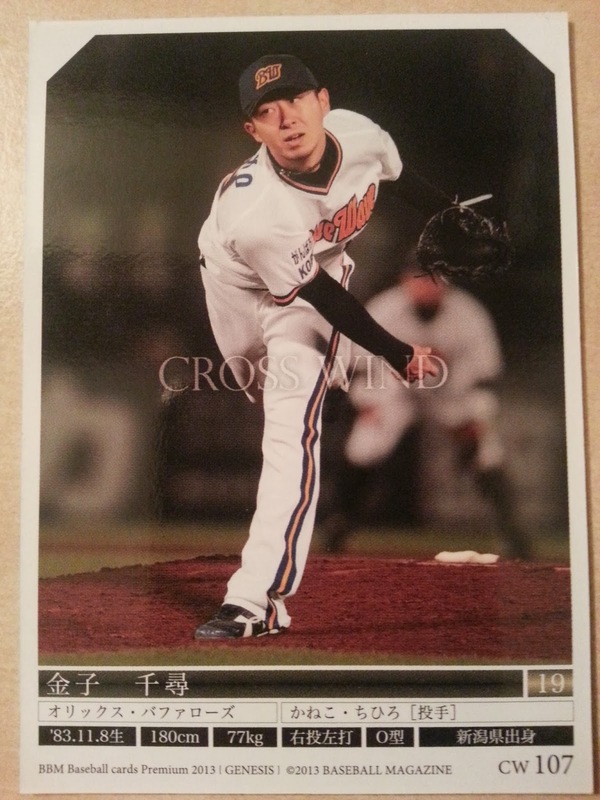 He's pitched for Japan in the 2008 Olympics and both the 2009 and 2013 World Baseball Classics. 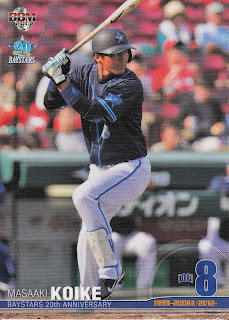 His career win-loss record through yesterday is 97-35 which includes the ridiculous 26-0 streak he has dating back to August of 2012. He's made the All Star team six of the seven years he's been in NPB. He is rumored to be heading to the US this off season via the posting system but in the meantime he's leading his Eagles to possibly their first League title (their magic number is currently 5) and their first Nippon Series appearance. He's probably going to win both his second Sawamura award and the PL MVP award this fall. 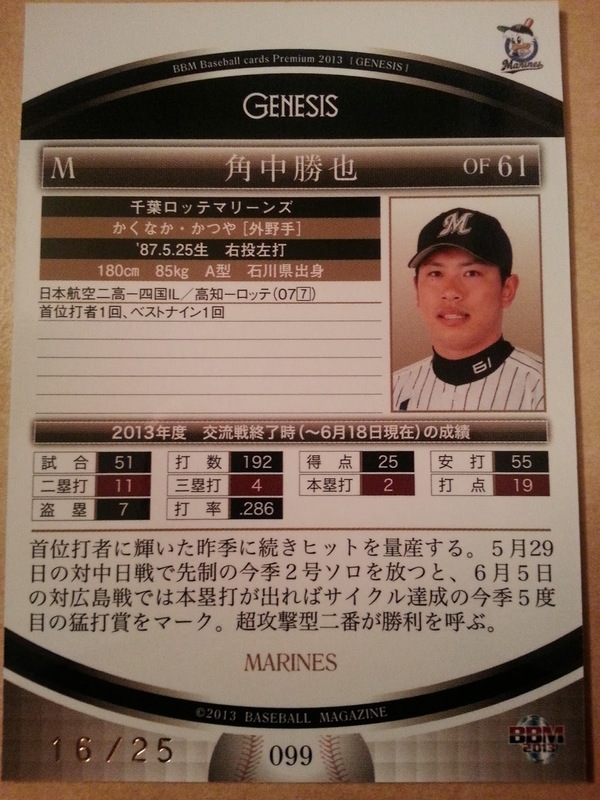 Saitoh, on the other hand, decided to go to Waseda University and study sociology. 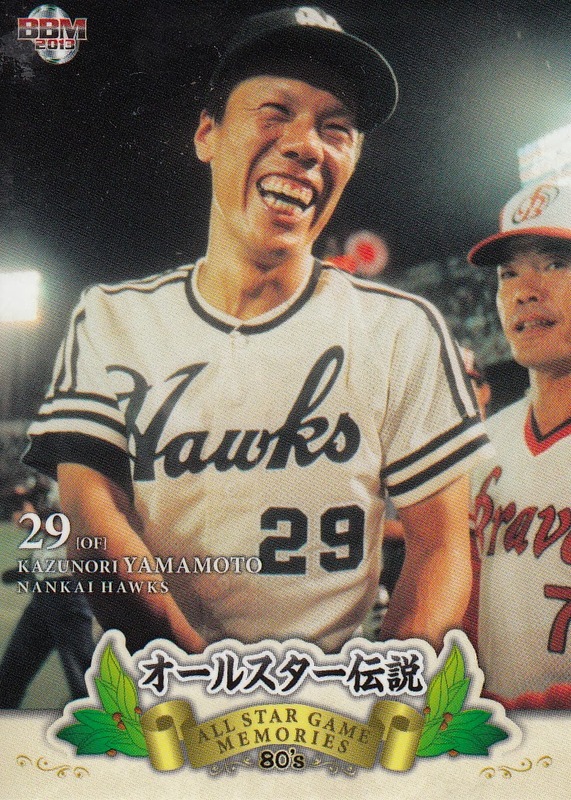 He pitched for Waseda's team in the Tokyo Big Six league, leading the team to a couple league championships during his tenure there. 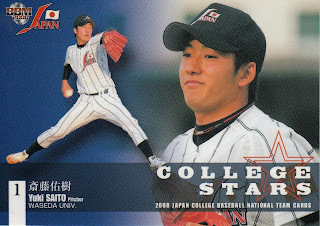 He pitched for Team Japan in a couple different collegiate tournaments also. He declared for the 2011 draft (held in October 2010) and, like Tanaka, was selected by four teams in the first round (Swallows, Fighters, Marines and Hawks) with the Fighters winning the lottery. 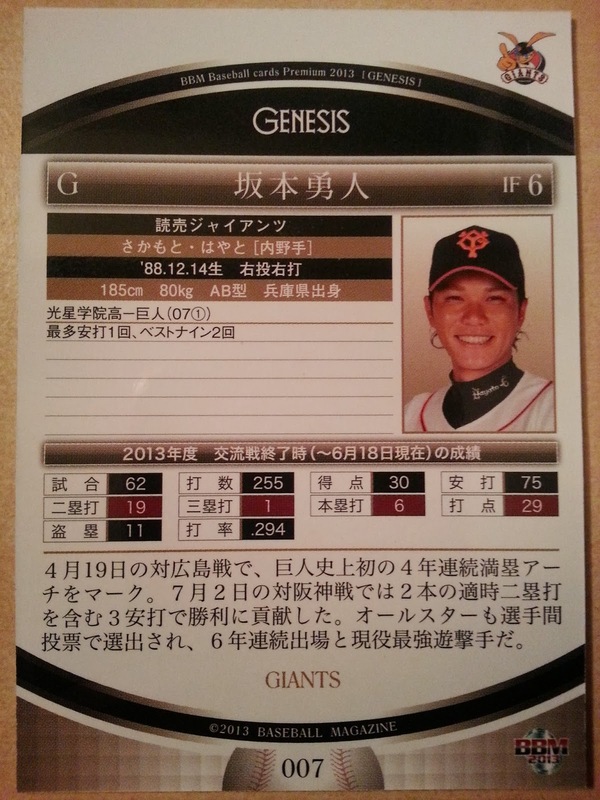 His professional career has not been anywhere near as successful as Tanaka's. 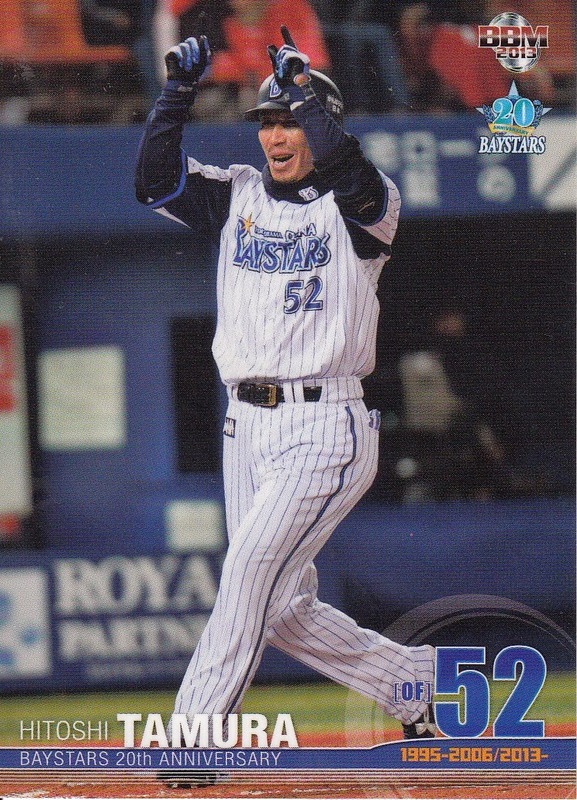 He was the Opening Day starter for the Fighters in 2012 and made the All Star team in both 2011 and 2012, actually starting one of the games in 2012. But he was demoted to ni-gun shortly after that All Star start, however, and has not made more than a couple appearances at the ichi-gun level since then (plus a two inning mop up stint in a blowout Fighters loss in last fall's Nippon Series). 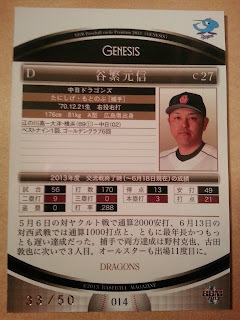 He has not appeared for the top team at all this year. 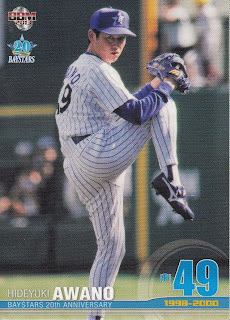 He had an extremely poor start in the minors last Friday, giving up nine runs in 2 1/3 innings against the ni-gun Marines. 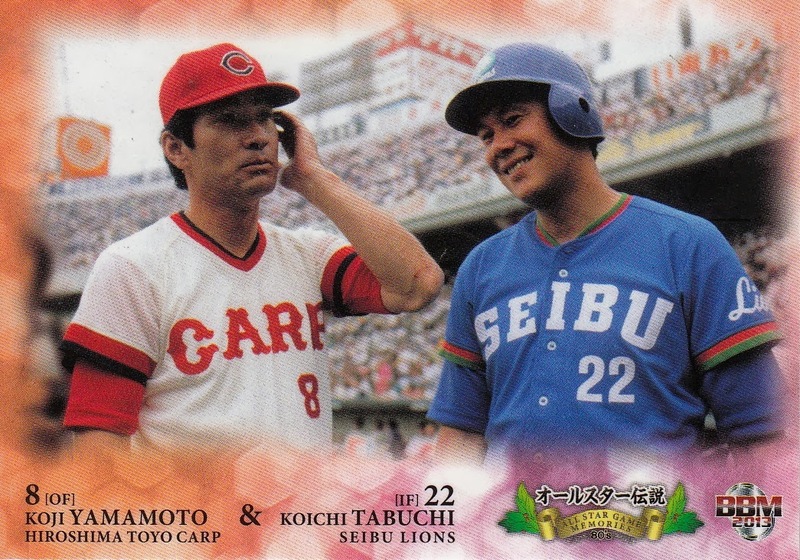 In his defense, Saitoh has had a right shoulder injury that he's been trying to work through without surgery. But after three seasons in NPB, he's got an 11-14 record. 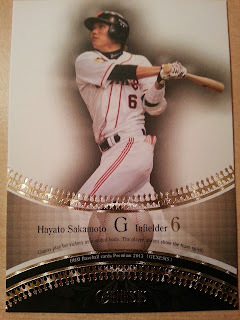 I've mocked Yuki Saitoh quite a bit over the years, but it's not really about him - it's about his celebrity. 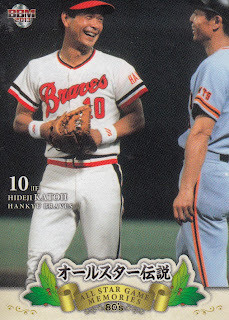 He became ridiculously popular following his Koshien stardom. I'm convinced that BBM started doing the Tokyo Big Six sets so that they print cards of him several years earlier than they would have otherwise. 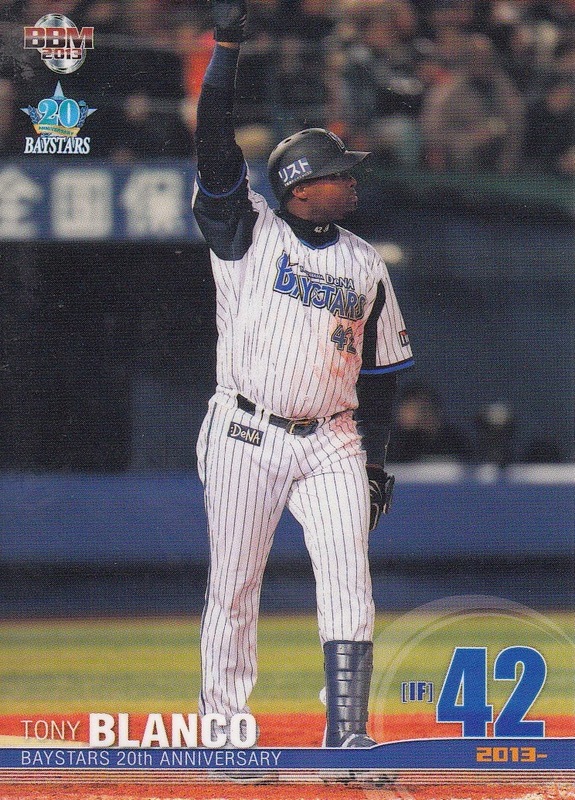 His two All Star team appearances were due to the "+1" voting where fans got to vote for the final players for each roster. 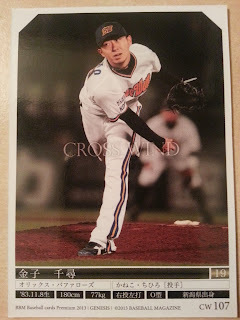 Even after several years of being mediocre, he still gets a lot of fans out to see him pitch - Deanna Rubin was at the game at Kamagaya on Friday and reported (on Facebook) that the ballpark was much more crowded than normal due to him pitching. So I think now that I will stop mocking him - it's not his fault that he's popular for something he did seven years ago and it's not really fair for him to have had to learn how to pitch professionally in a fishbowl. 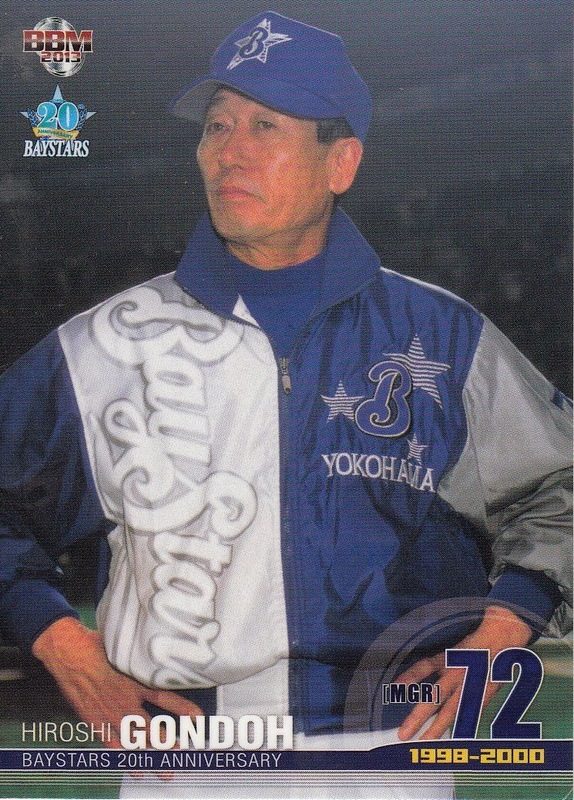 Following the 1992 season, the Yokohama Taiyo Whales changed their name to the Yokohama Baystars (or BayStars or Bay Stars - never quite figured that one out). 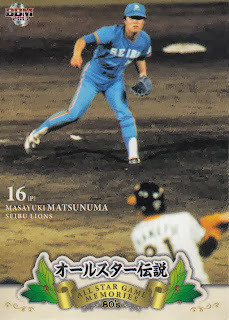 I'm not entirely sure why they made the name change - Wikipedia says it's due to the parent corporation Taiyo changing their name to the Maruha Corporation which doesn't quite make sense. Maruha had been one of the owners of the team for years - their uniforms had featured a patch for Maruha on the sleeve for years ( from the early 50's until the team moved to Yokohama in 1978), So I think Taiyo always WAS Maruha. 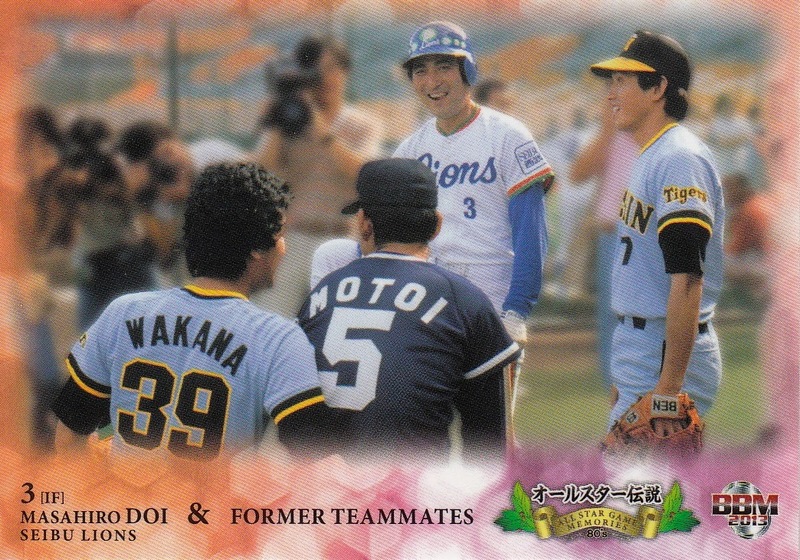 Regardless, 1993 was the first year for the renamed team. 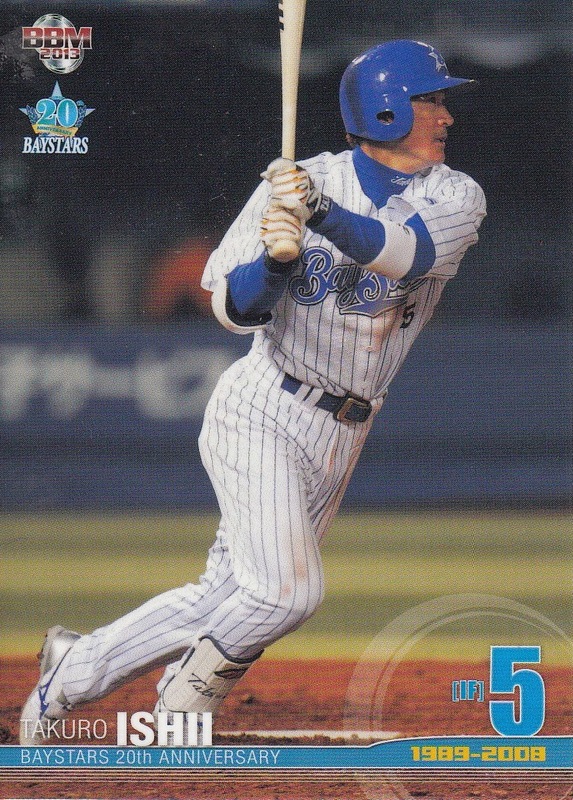 BBM published a 20th Anniversary set for the Baystars a few months back. The base set features 81 cards, a little smaller than the "standard" size for BBM's Anniversary sets (99 cards). As usual, this breaks down to a bunch of OB player cards (57), a bunch of cards for the current team (18) and a couple subsets - former managers (3 cards) and "Baystars History" (3 cards). 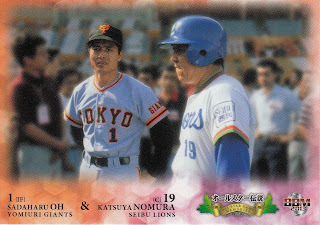 It's not a bad little set, although it's probably only a set you'll want to pick up if you're a big Baystars fan (or love OB sets like I do).